Hey there! Like I told you about last month, I'm in a Facebook book club call The Polished Bookworms filled with wonderful folks who are into both reading and nail polish We vote on a book to read each month and on the last day of the month we post our mani's based on the book. This month's genre was Young Adult and it was a dystopian novel, The Maze Runner by James Dashner, that was chosen. 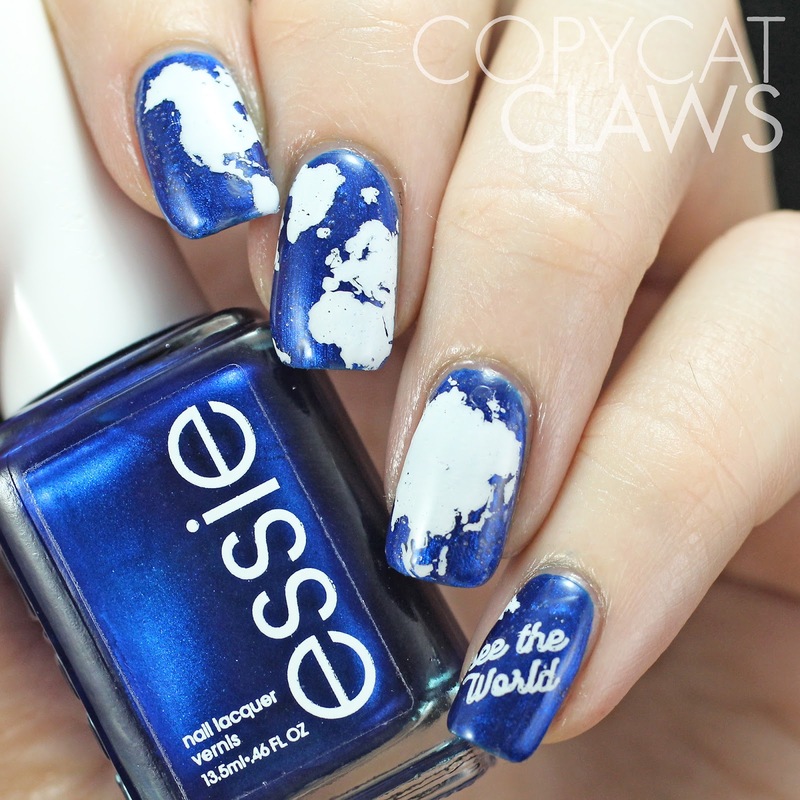 Here's my stamping mani inspired by the book. Hey there! Happy Friday! 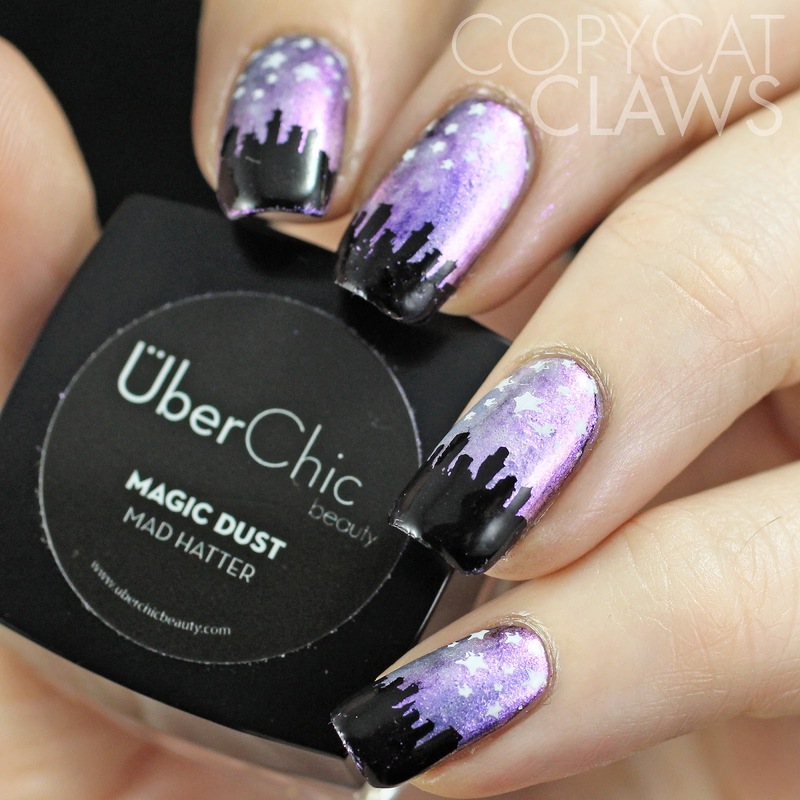 Last week I shared my thought on the UberChic Beauty stamping plates. Along with the plates, I was sent a jar of this neat product she has called Magic Dust that is specially formulated to work with nail polish to spruce up any nail polish. 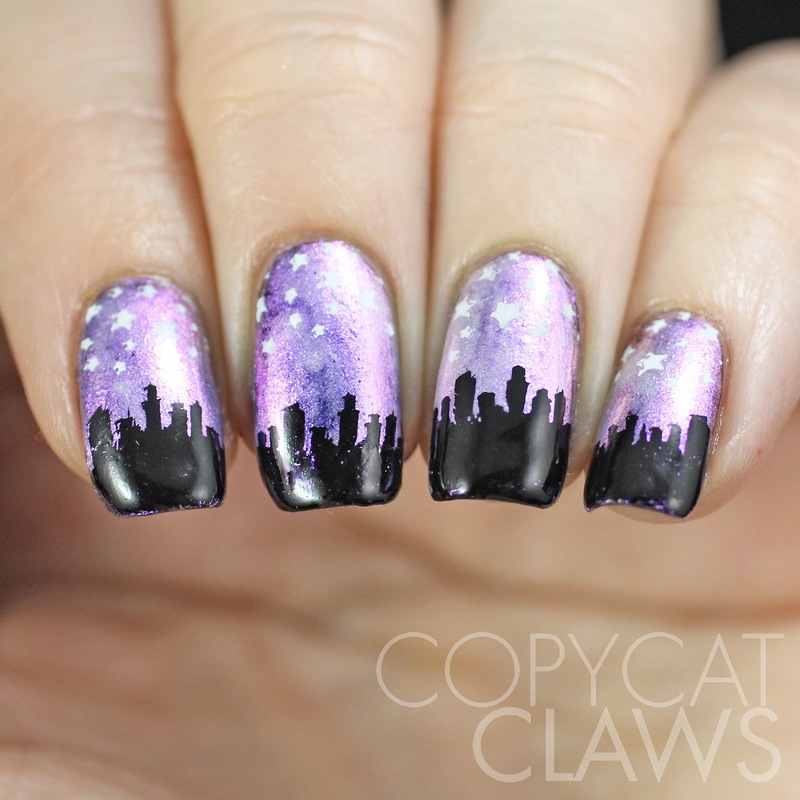 Then, of course, I stamped it with a skyline image from plate 2-02. Hey there! 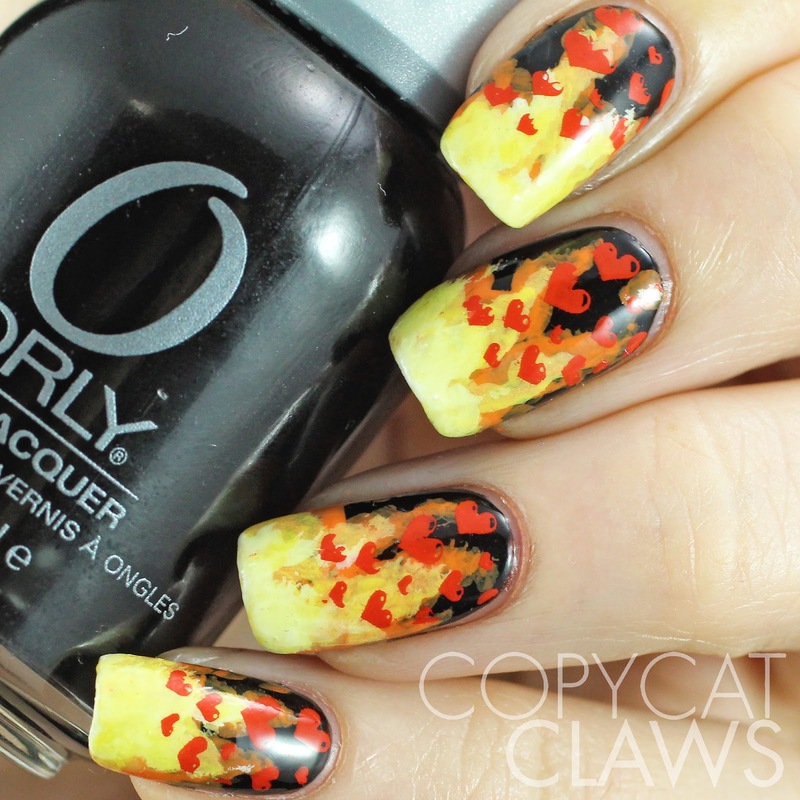 This week's prompts for the 52 Week Pick n Mix Challenge are Houndstooth and Red, Yellow and Orange. 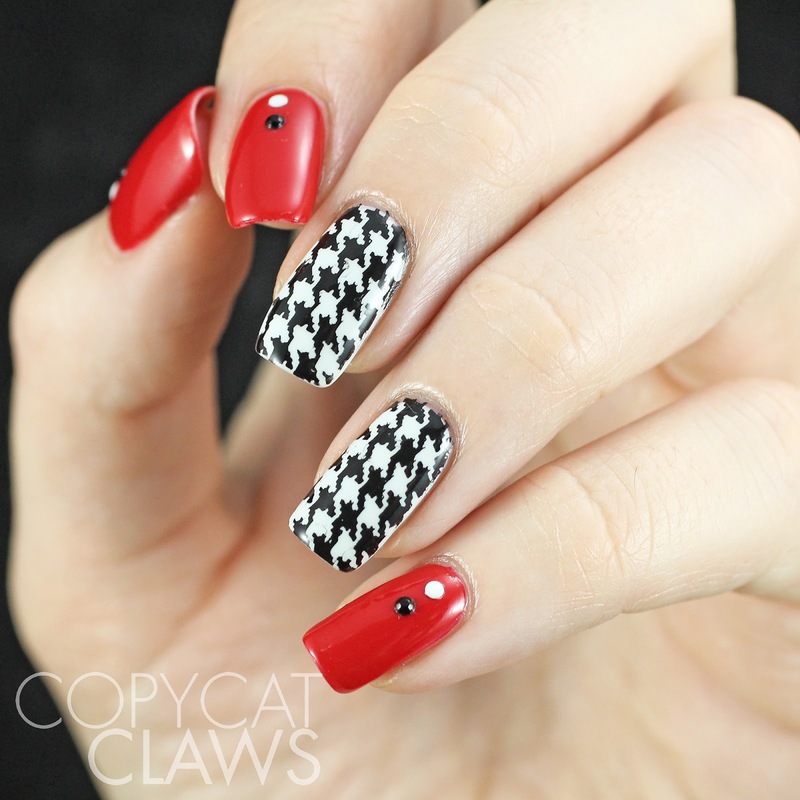 At first I was going to try to incorporate both themes but in the end I wanted a classic black and white houndstooth pattern so I skipped a couple of colors. I absolutely loved wearing these nails. I felt like I belonged in the 1950's or something! Hey there! 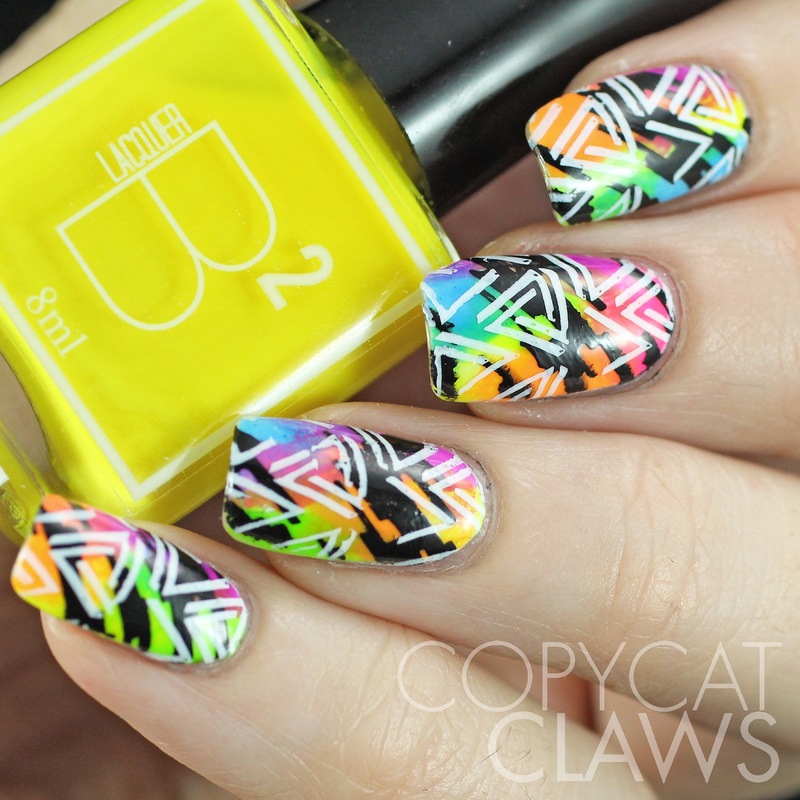 Sorry about not finishing my reviews of the new UberChic Beauty stamping plates yesterday like I had planned. I did not get much sleep on Friday so I was a complete couch potato yesterday. 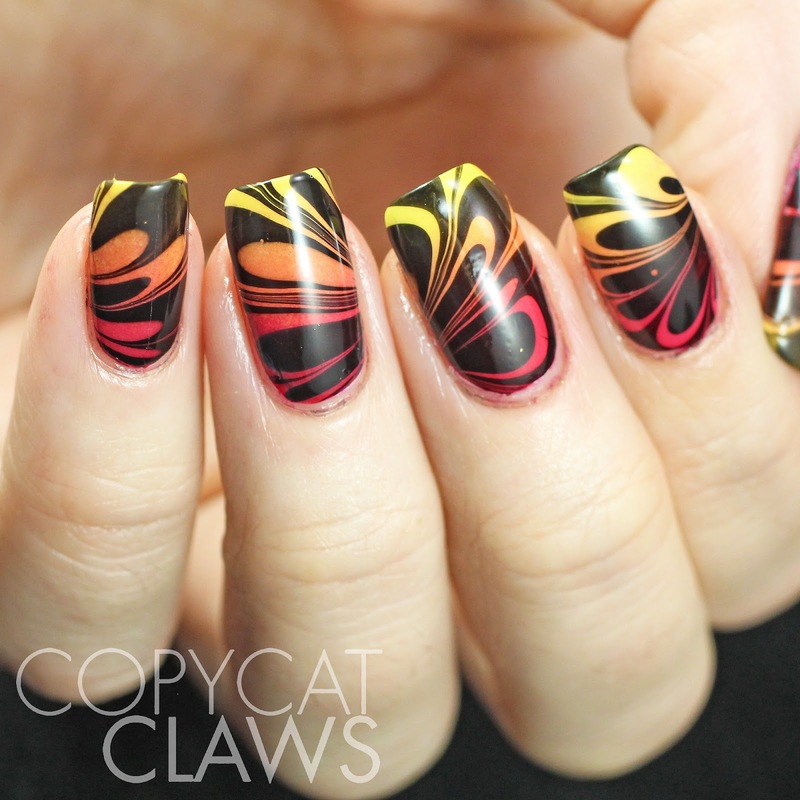 But here we have a mani I did with UberChic plate 2-03. 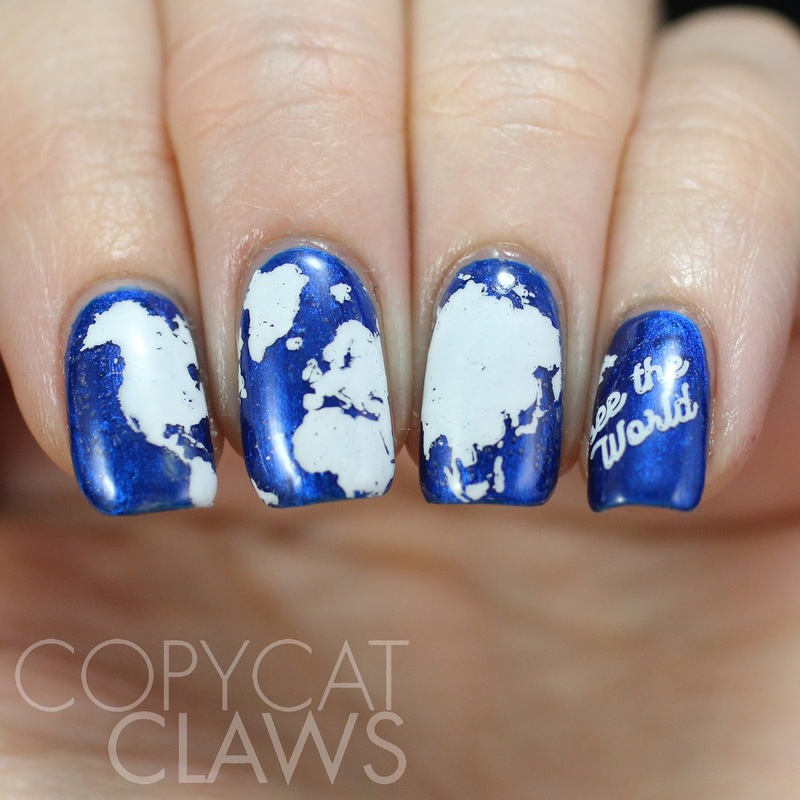 It's a mini globe on my nails! Hey there! Happy Friday everybody! 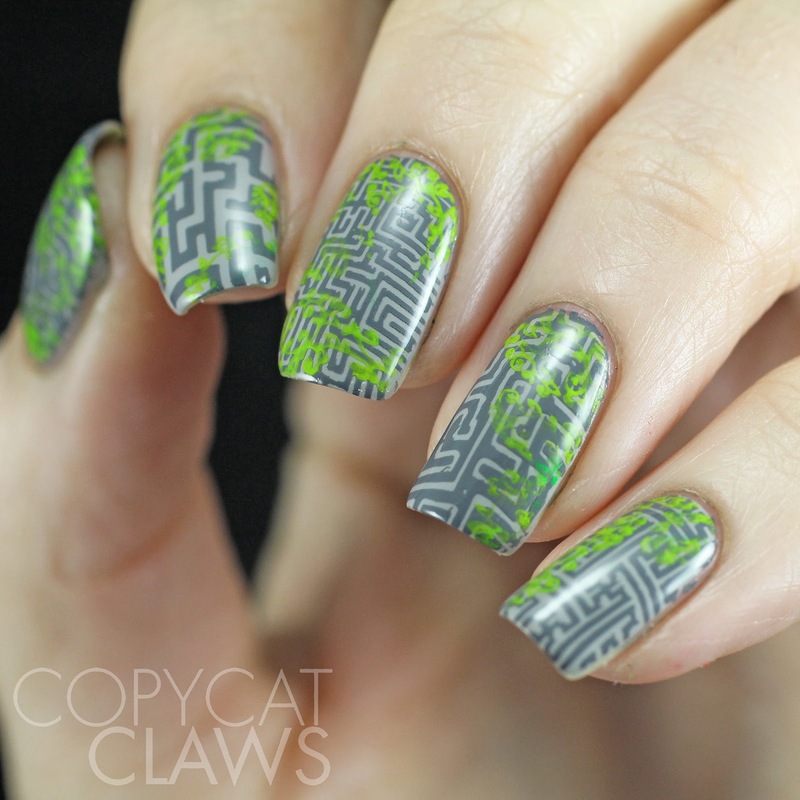 Today I'm continuing my review of the new UberChic Beauty stamping plates with today's feature plate, 2-02. 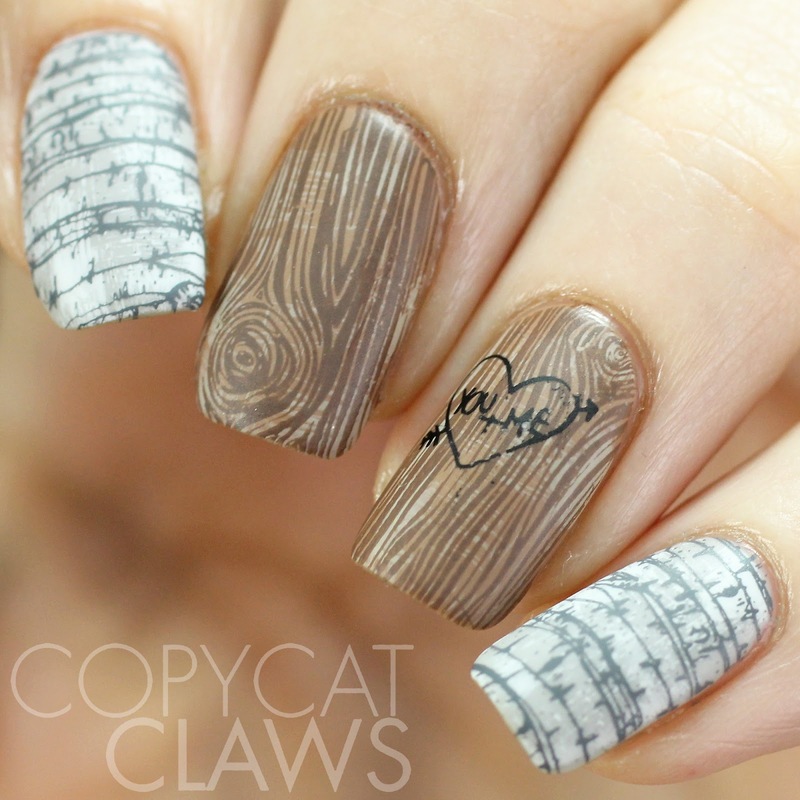 I've always wanted to do wood grain nails and this plate has a couple of perfect patterns for it so it was the perfect opportunity. So I used a couple of different tree-like patterns for these, along with a little tree carving. Hey there! Second post in one day so sorry if you're sick of me. 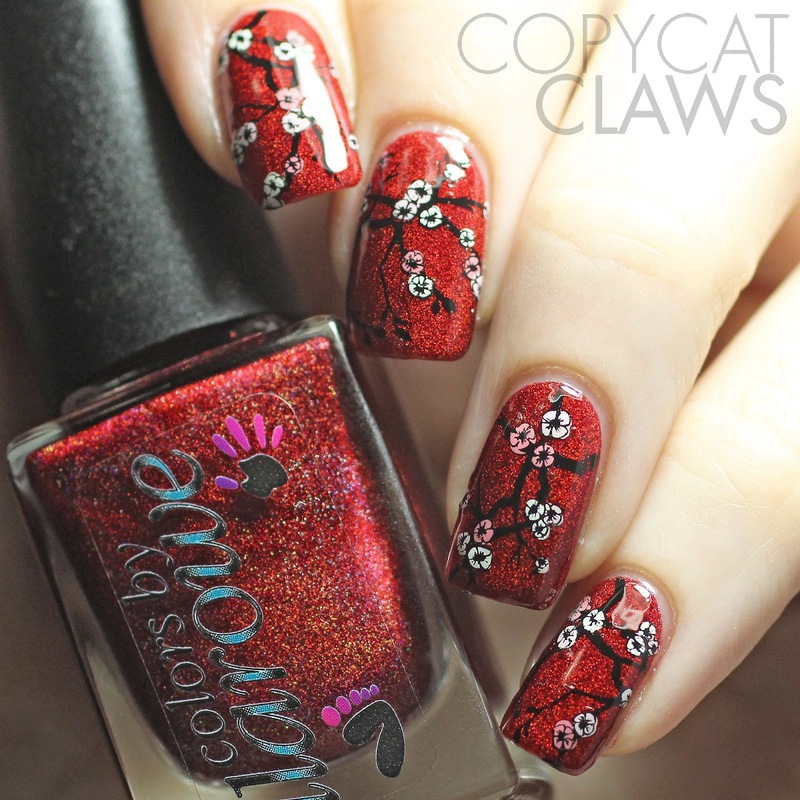 I just really wanted to post my current Chinese New Year nails while it's still CNY and I wanted to continue with my review of the UberChic Beauty Stamping plates. Today's mani was done for the Crumpet's Nail Tarts 52 Week Pick n Mix challenge using 10.1 Polish Frosted Sheers and UberChic Beauty's plate 2-01. Hey there! 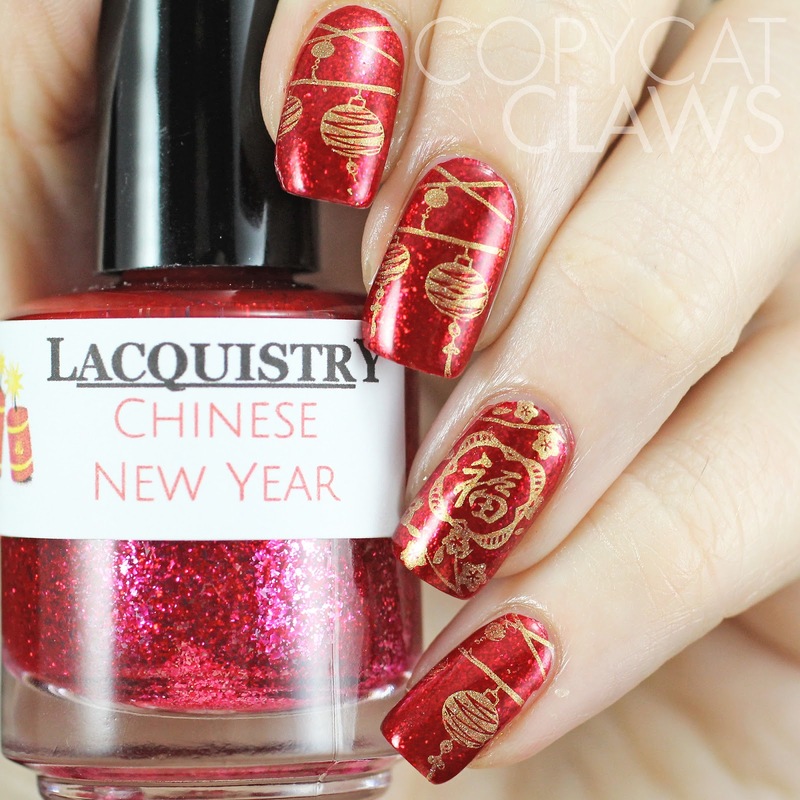 Since Sunday's stamping challenge was Chinese New Year nails, I wasn't going to do another CNY post BUT then I received my order with Lacquistry Chinese New Year yesterday and I couldn't resist putting it on last night. And since I wasn't tired at midnight, I decided to stamp it to make it even more festive (and so I could show my co-workers from China today). Hey there! 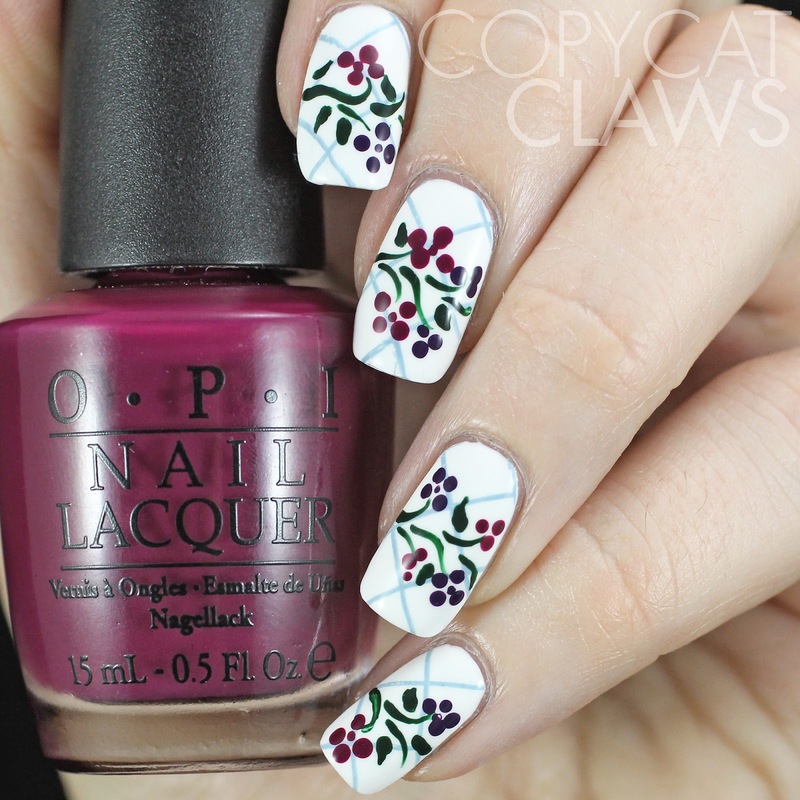 Yesterday I told you about some new plates from UberChic Beauty that I've been lucky enough to review and showed you a mani I did using plate 1-01. Today I have UberChic's plate 1-02. 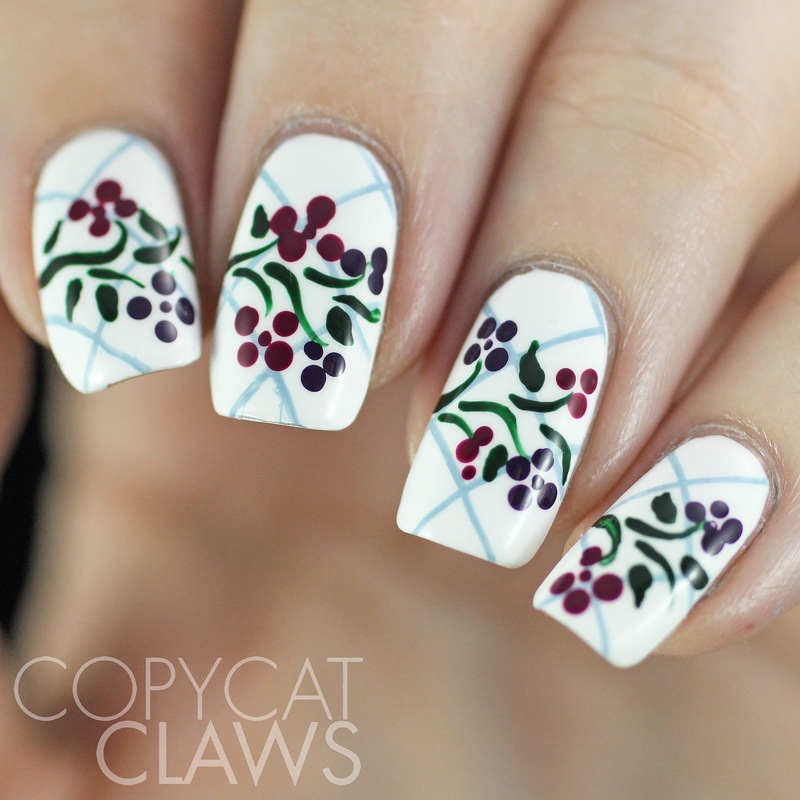 This was the first mani I did the day I received the plates. 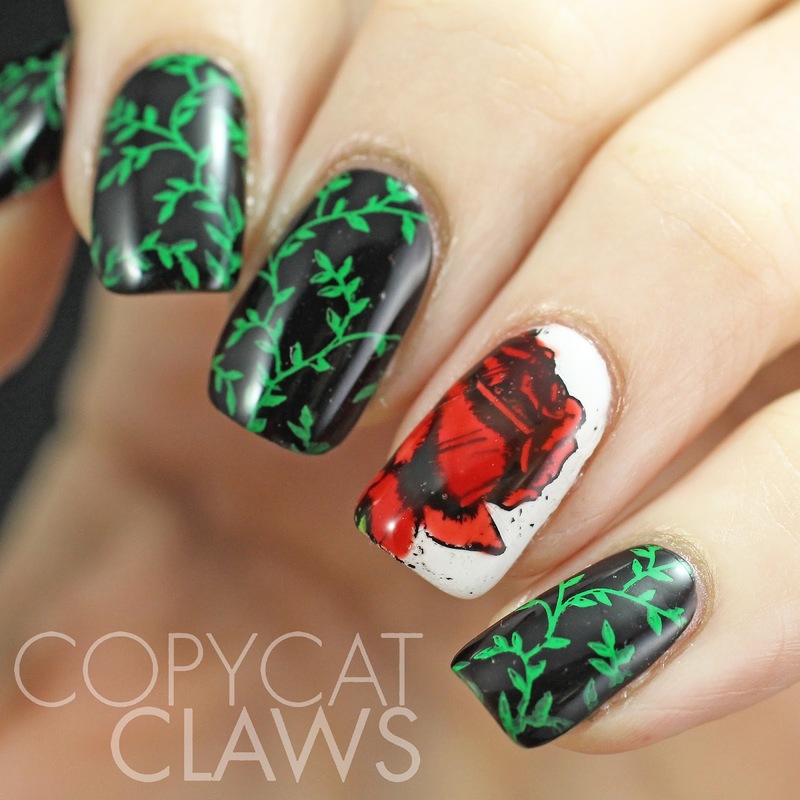 I'd been drooling over the flower images before I received the plate and couldn't wait to get that rose onto my nails! Hey there! I'm so excited for tonight's post. 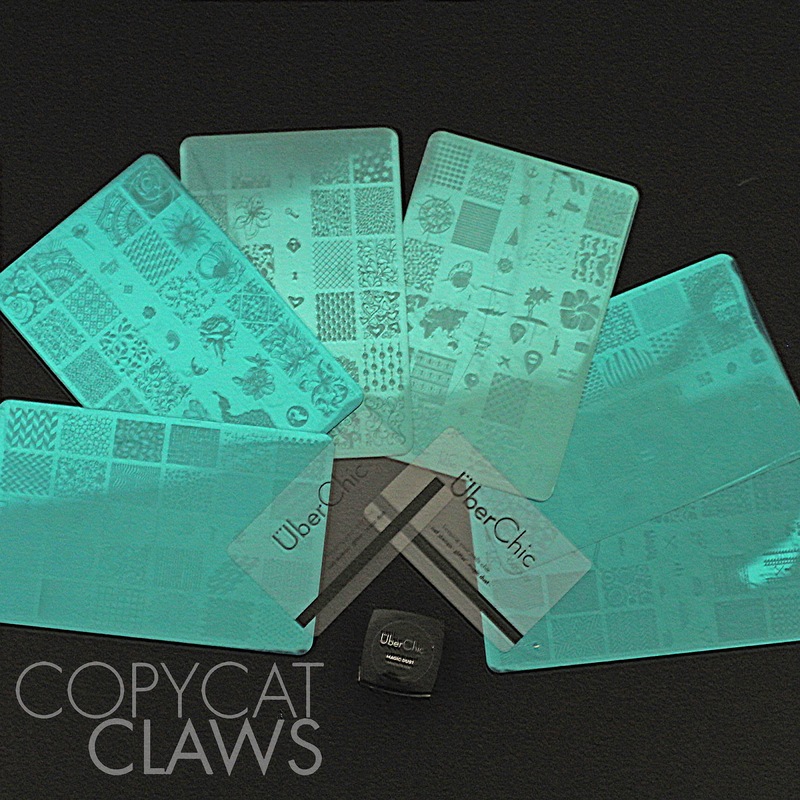 I'm showing you some of the newest stamping plates on the market. These new plates come from UberChic Beauty and, spoiler alert, they're fantastic! I was sent all 6 of their plates to review, along with their scraper and Magic Dust (more on that will be coming in a later post). 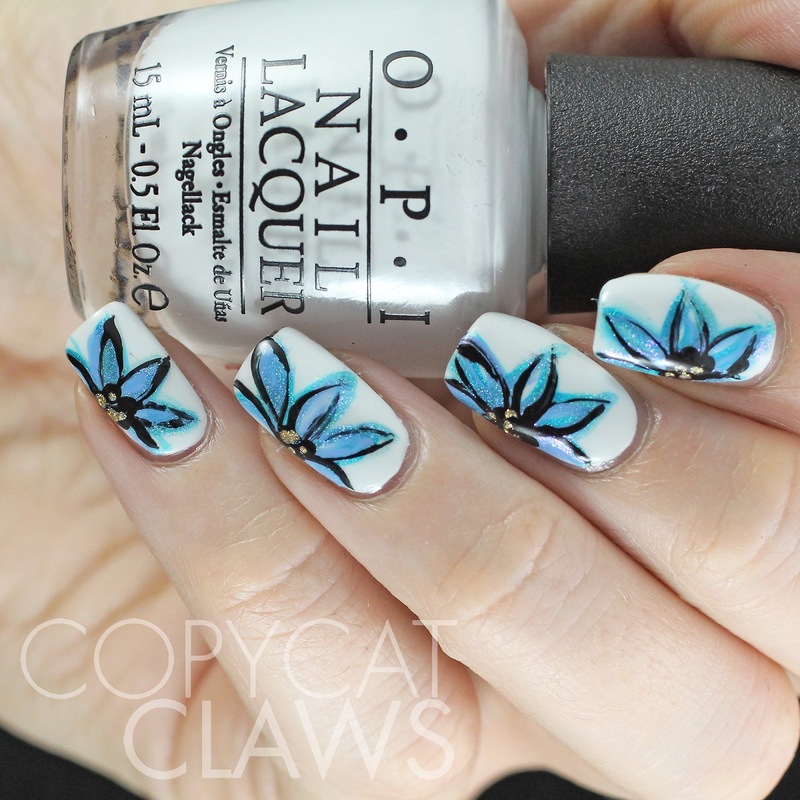 I have spent days playing with these plates and have already come up with quite a few mani's that I adore so I've decided that I'll be sharing a mani from each plate over the next 6 days rather than just breeze over each plate in one big post. So keep reading to see all the details on UC Plate 1-01. Hey there! 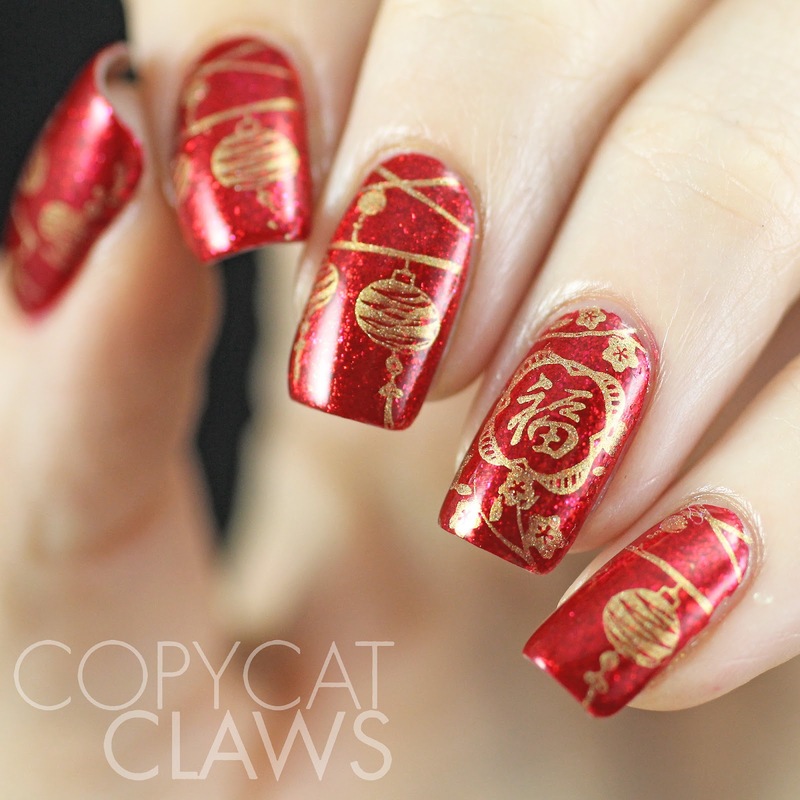 According to my google searching Chinese New Year is this Thursday so it makes sense that it's this week's Adventures In Stamping Sunday stamping challenge theme. 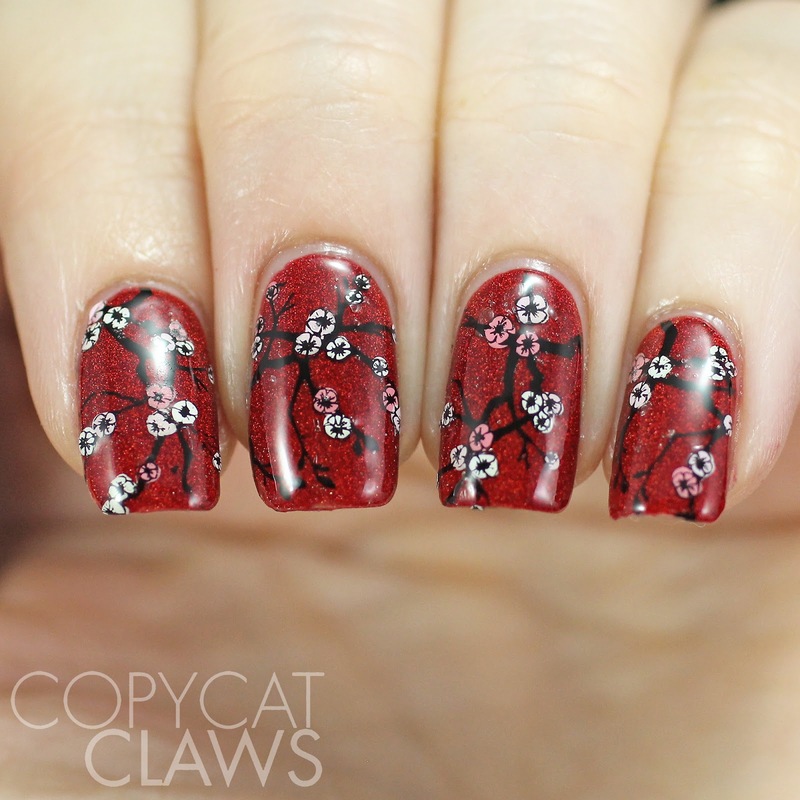 I loved the ones I did last year (mostly because my co-worker told me about what the symbols meant) but I didn't think I should do another symbol-based mani so instead I went with cherry blossoms to celebrate this year. Hey there! Happy Valentine's Day folks! I'm single so I spent all day editing photos and now I'm watching Gone Girl with my sis and binging on chips. Oh, the life of a single lady. Luckily this is pretty much my ideal Saturday night! I guess you guys are my Valentines because I do heart you! 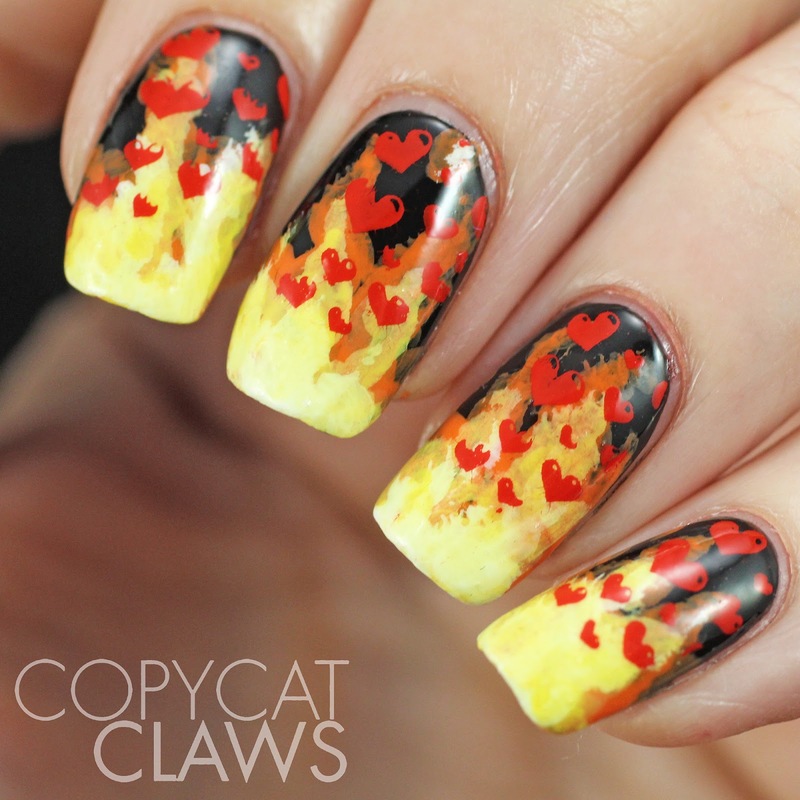 Tonight's post is another "hearts on fire" mani, kind of. 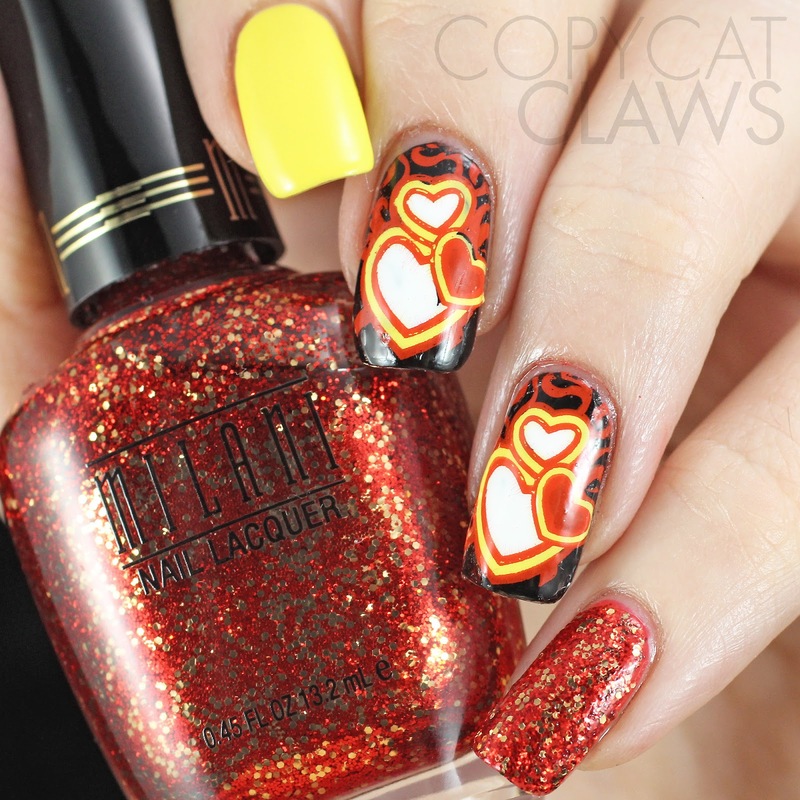 This Pueen image, in it's entirety, looks more like hearts on fire but my nails aren't big enough to show the whole thing. 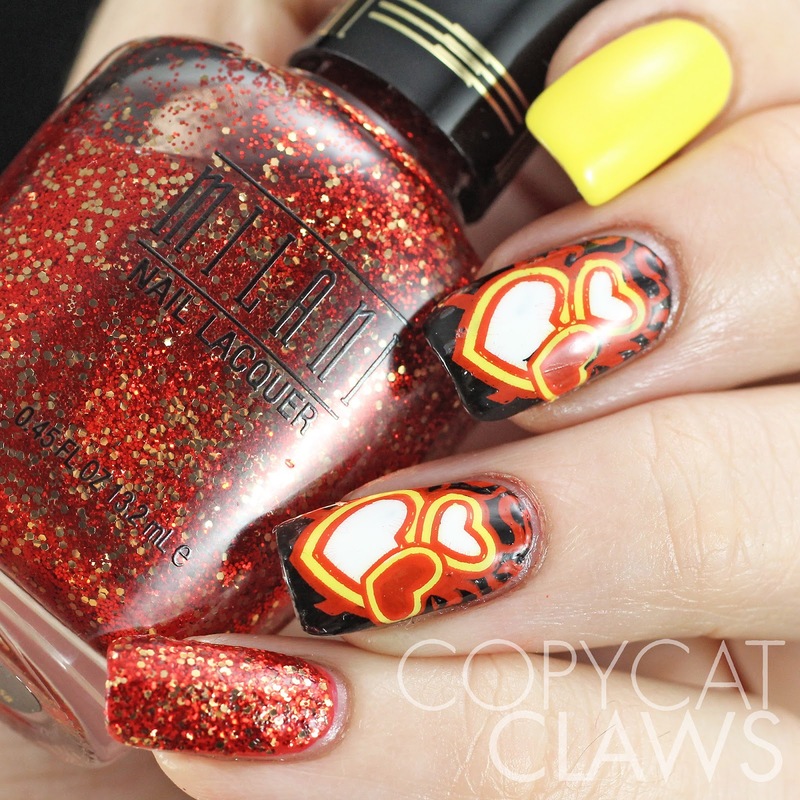 The stamping image is Pueen35 stamped with Mundo de Unas Reddish and filled with yellow and white acrylic paint. The other colors in this mani are Sally Hansen Mellow Yellow and Milani Red Sparkle over Picture Polish Love, fittingly for the occasion. All finished with HK Girl. Well I'm going back to my movie and chips. Hope everyone had a day filled with love, of any kind! Hey there! Well it's the last day of The Digit-al Dozen's Patterns on Patterns week and I'm glad I managed to pull out five looks for this theme. It was a tough one! For my final look I'm really stretching the definition of the term "pattern". It's really more of a "technique on technique" mani. I wasn't going to include it but I absolutely loved how it turned out so I'm throwing it out there anyways! Keep reading for details AND to see the other couple of patterns-on-patterns that I rejected for these ones. Hey there! Day 4 of the Patterns On Patterns week for The Digit-al Dozen. 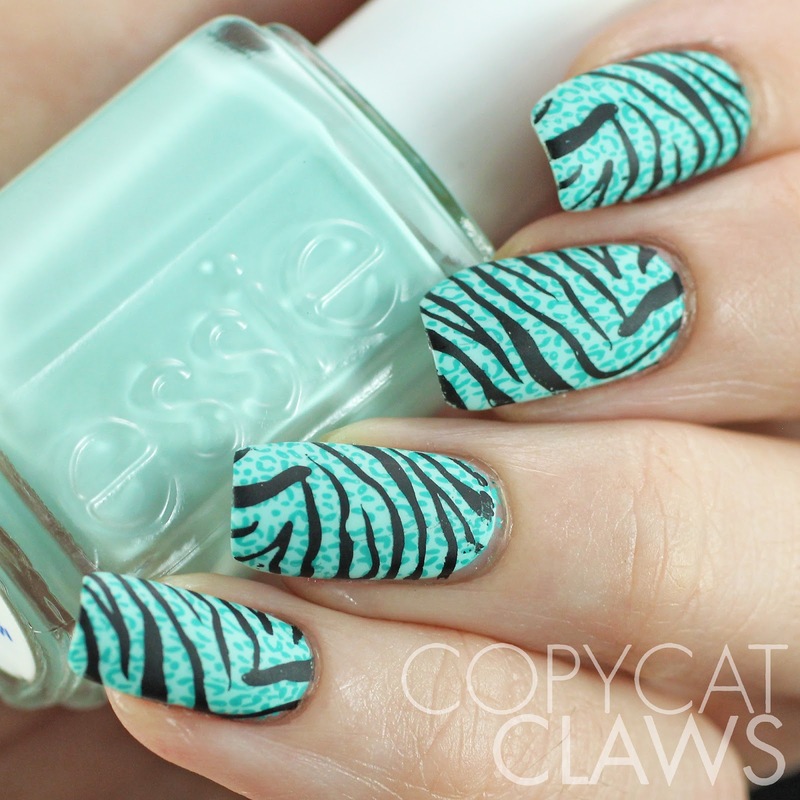 I did this zebra-on-leopard stamping at the suggestion of my darling sister when I was trying to think of ideas. She wanted pink but I had to go with turquoise (simply because I like turquoise nail polish so much more). A few of the other girls have done some fantastic leopard/zebra combinations this week and honestly mine is bit boring compared to theirs but that's okay. 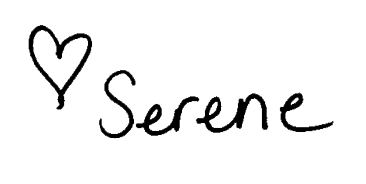 They give me something to aspire to! Hey there! For Day 3 I have a bit of an anti-Valentine's Day manicure. 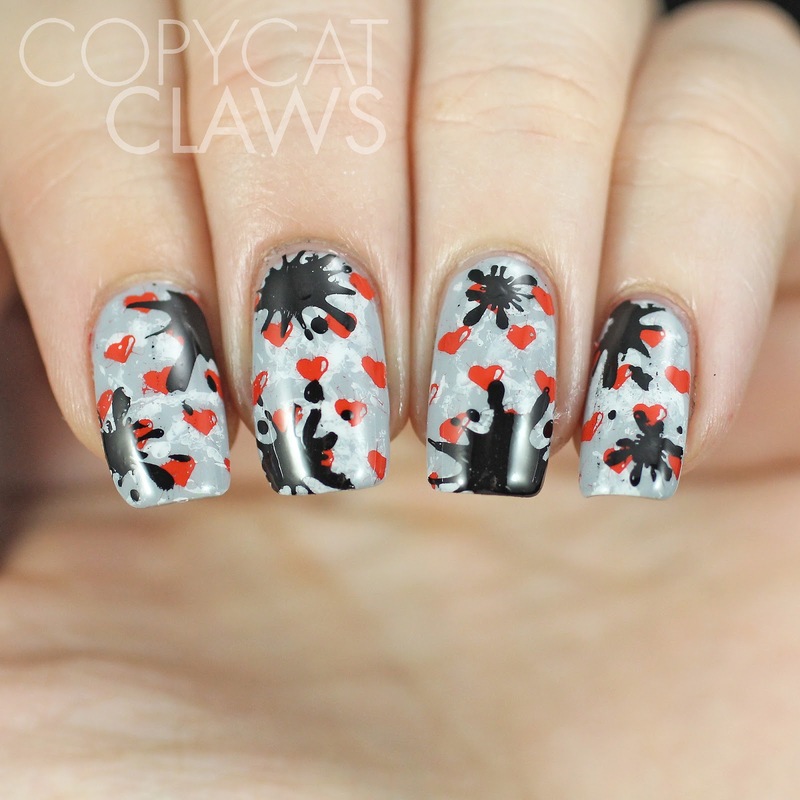 We don't all have Valentine's and once in a while I feel the need to put that on my nails! 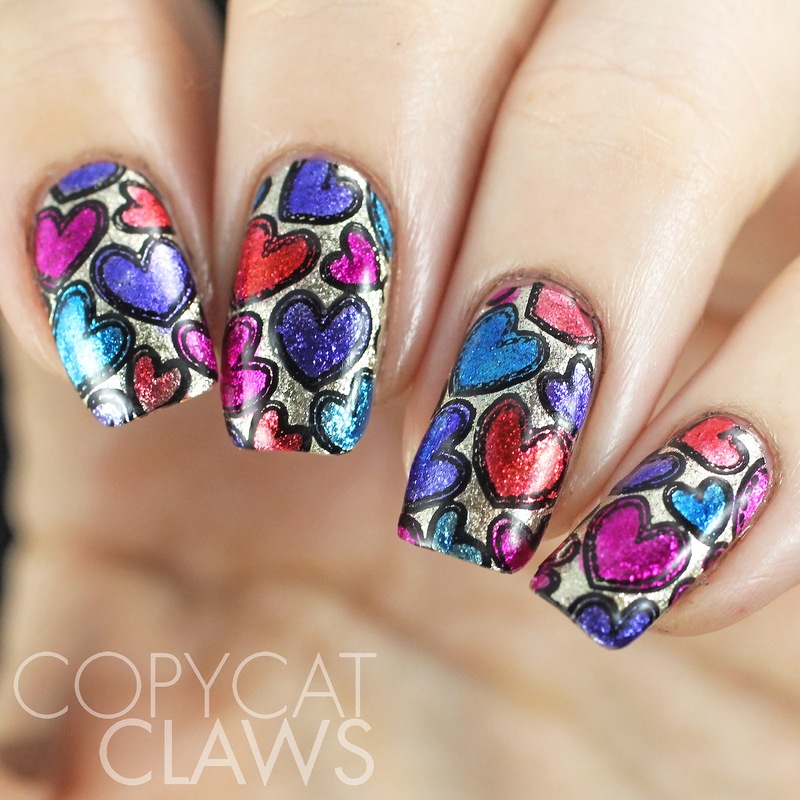 So I did some double stamping over a saran wrap base that appears to suggest that I hate hearts! Hey there! 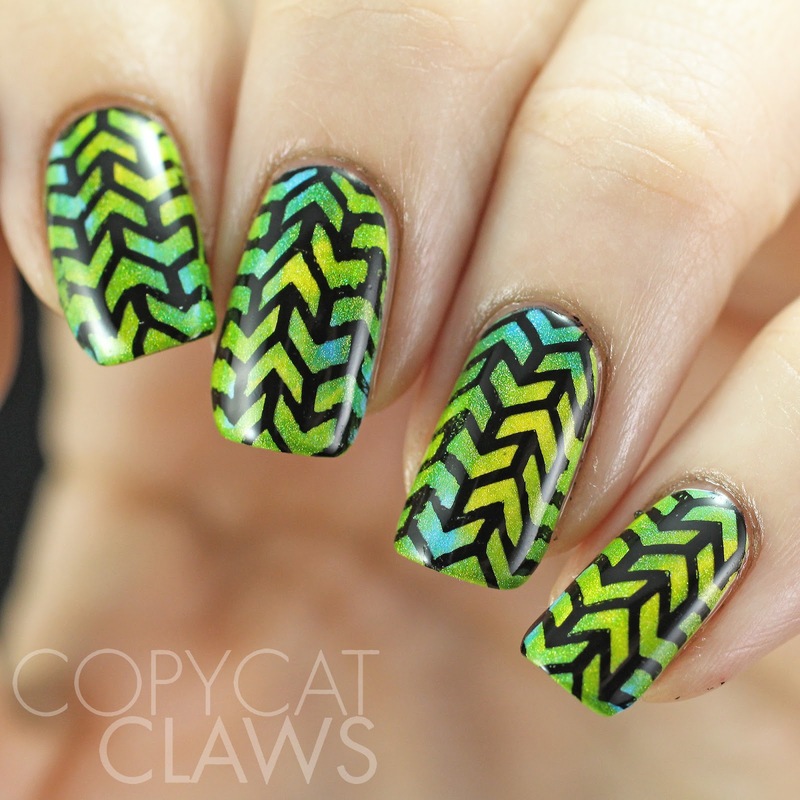 For my Day 2 Patterns on Patterns Digit-al Dozen mani, I have the biggest eyesore! 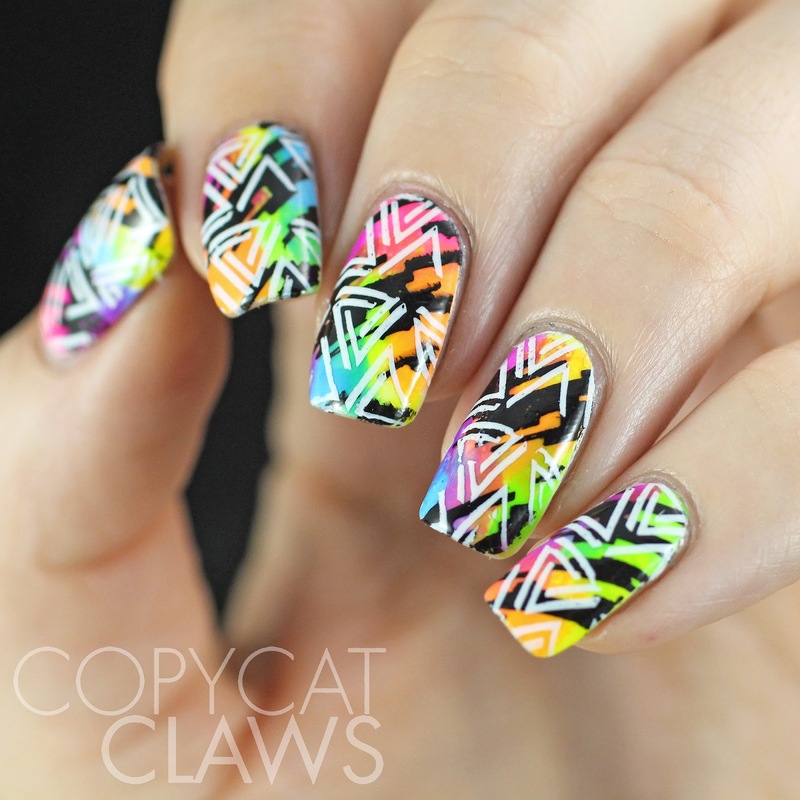 But the 80's weren't exactly subtle in their fashion sense so why should my 80's themed nails be subtle?! These are really busy and I actually quite like them now that I'm seeing them again. And you can't go wrong with a good glow in the dark polish...so when using 6 glowers, it's guaranteed to be a win, haha! Hey there! In case you hadn't heard, this week's Digit-al Dozen theme is "Patterns on Patterns"...sounds daunting eh? Needless to say, I have a lot of stamping mixed with other patterns/techniques this week so hopefully I can keep you interested. For my first time I'm posting something that reminds me of the stencilling techniques that were all the rage in the late 80's/early 90's. I even remember stencilling the lean-to at the lake lot when I was pretty young. Hey there! 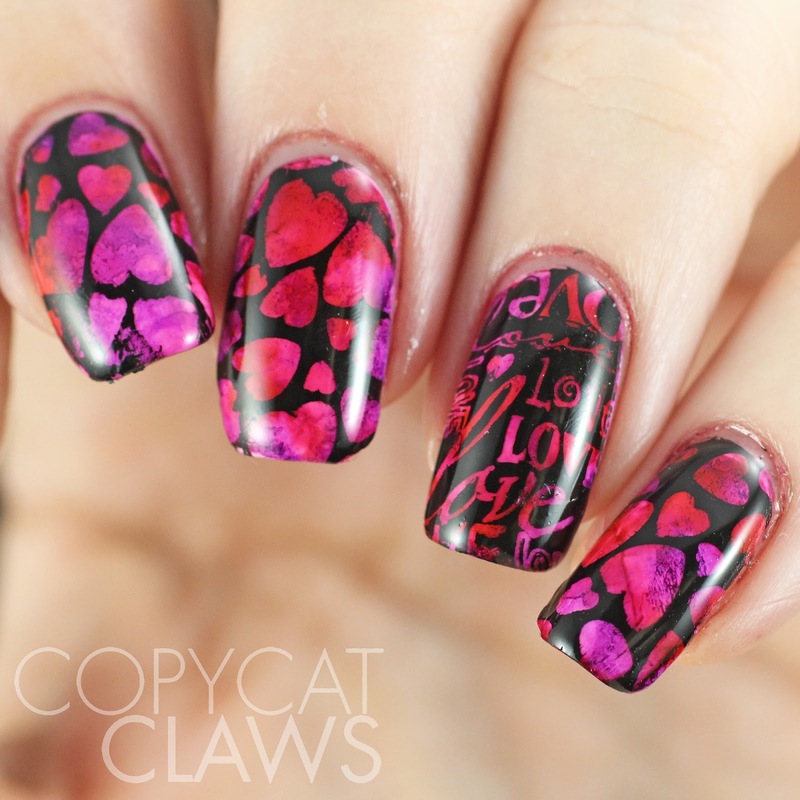 Not surprisingly, today's Sunday Stamping theme is Valentine's Day Nails so I thought this would be a good time to post these nails that I did with red and purple alcohol inks last weekend. 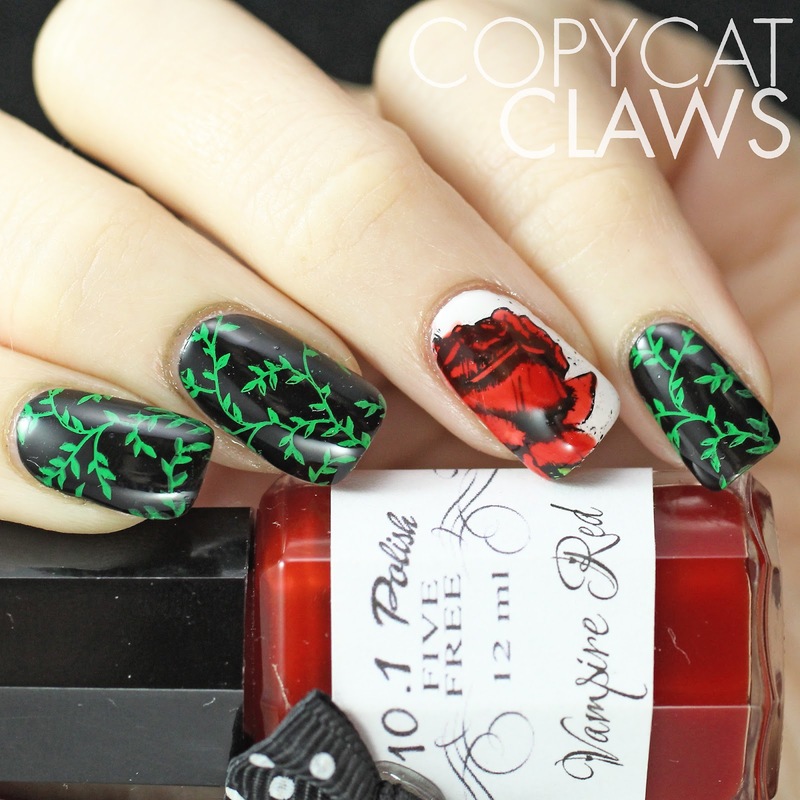 If you haven't heard of using alcohol inks on nails before (honestly I'd never heard of alcohol inks at all before a couple of weeks ago), keep reading for a link to a really helpful YouTube video. Hey there! It's Friday! 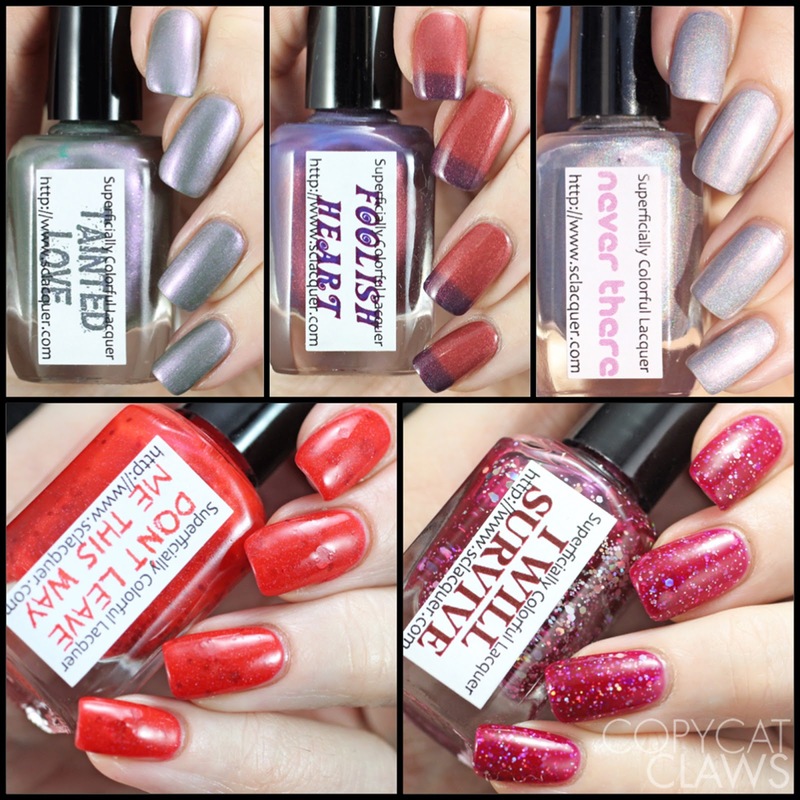 Today I have some swatches of the Valentine's Day collection from Superficially Colourful named Troubled Love. I've been wearing this collection all week. I adore that it is inspired by "troubled, one-sided love" with names of songs from Jin's personal musical playlist. This collection has a little bit of everything - glitter, holographic, thermal, duochrome...everything! 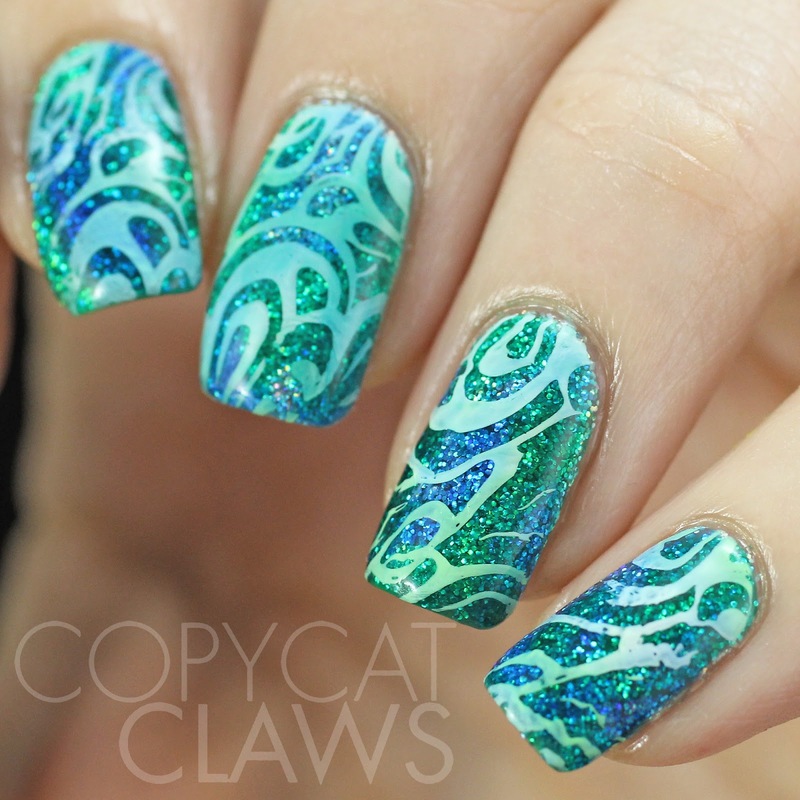 Keep reading to see more swatches and some stamping that I wore on a couple of them. Hey there! 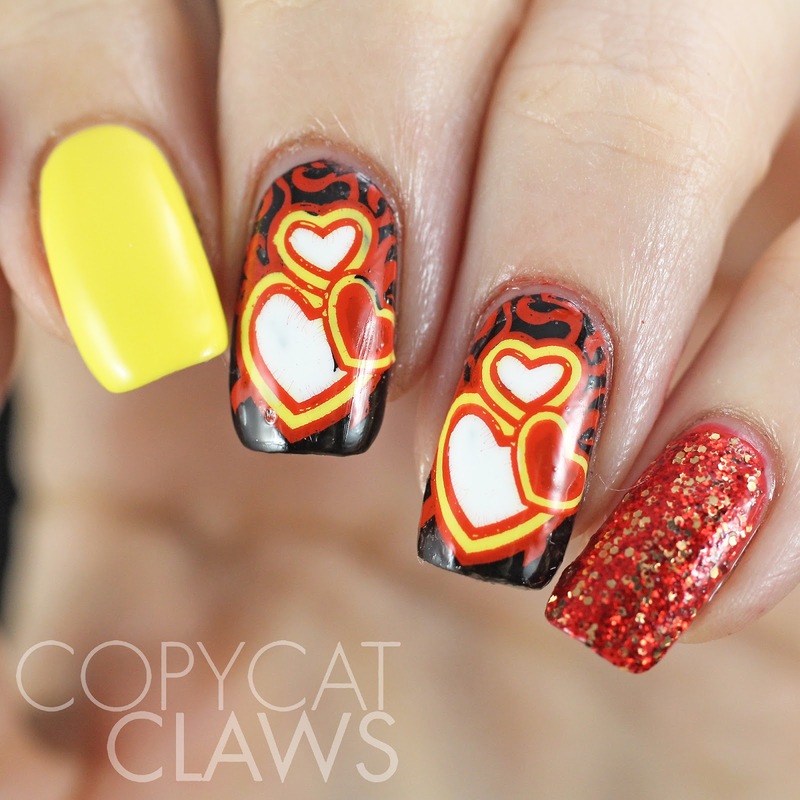 I guess now that it's February I feel like I can do some Valentine's Day manis. 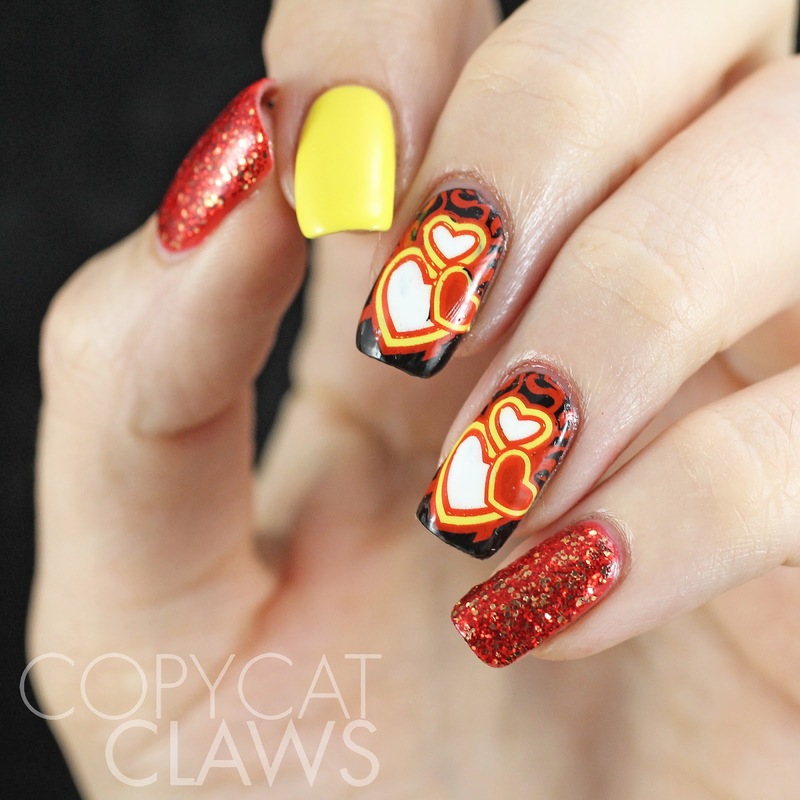 I'm not a fan of V-Day at all but I do love some cute heart nails. 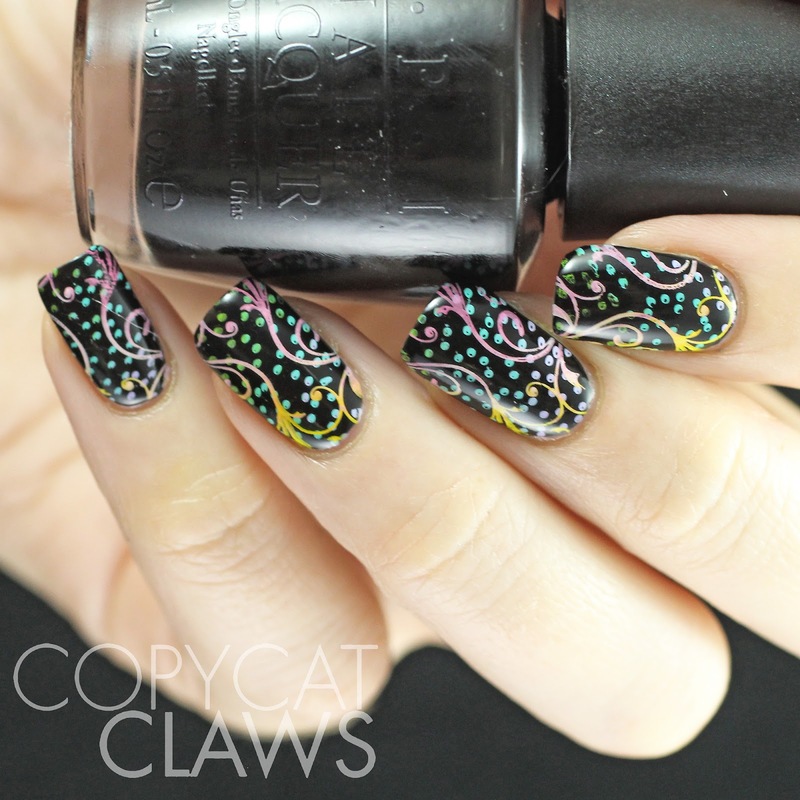 Here I did leadlighting with Esmaltes da Kelly Soap Bubbles with stamping from one of the newest Bundle Monster plates. Hey there! How's your Monday going? Anyone have a Superbowl hangover? I'm not a football fan at all but even I turned it on the TV for awhile yesterday. And learned that, yup, I still don't understand football! 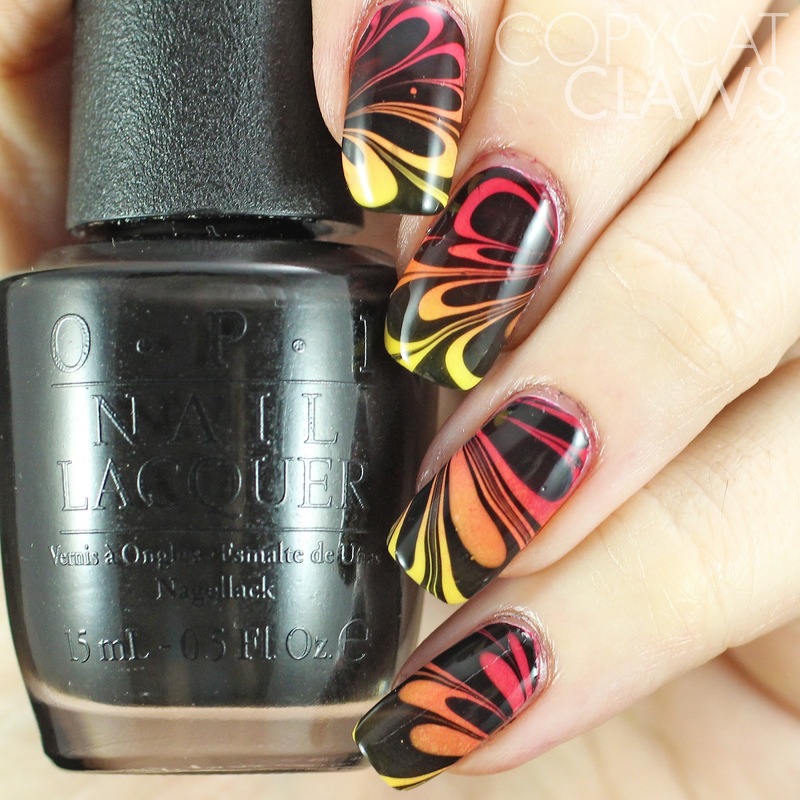 Anyways, here's my mani I did for this week's 52 Week Pick n Mix challenge. 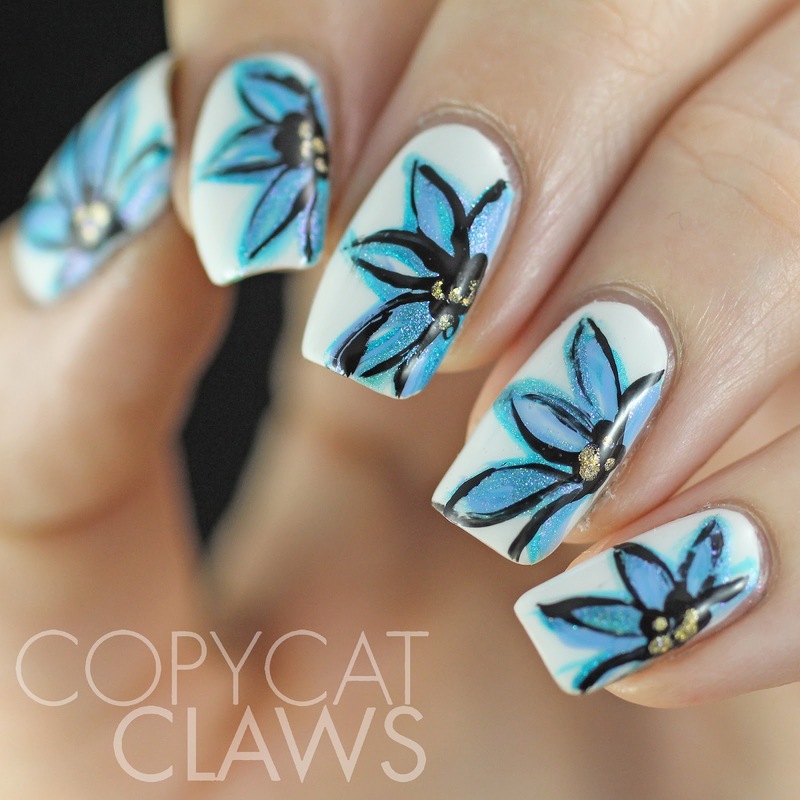 This week is flowers and pale blue so I combined them into this look that turned out to look a lot like the flower mani's of the amazing Emily of The Lacquerologist. Hey there! 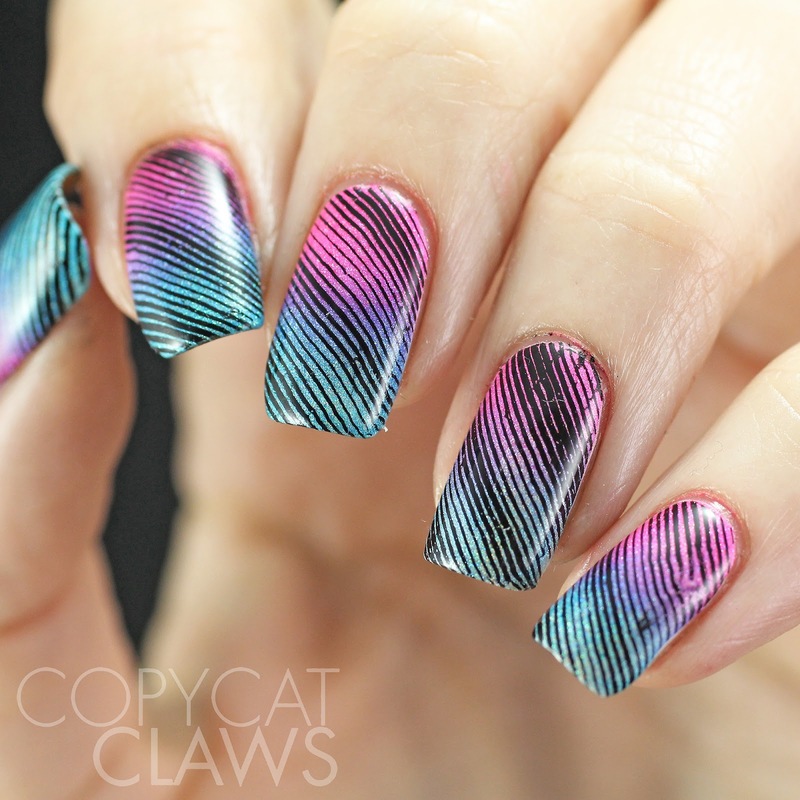 This week's Adventures In Stamping Sunday challenge theme was pink and black. Sounds easy and yet the ones I did turned out to disappoint me. But they did give me an opportunity to use one of the new China Glaze polishes I just bought.